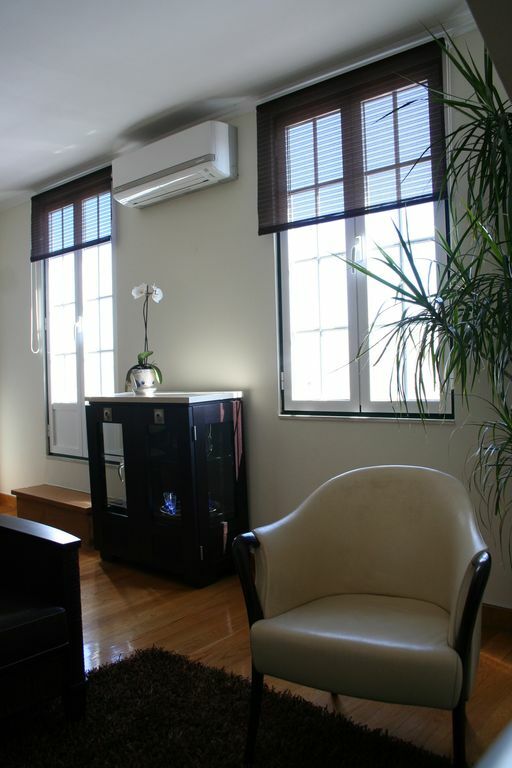 Apartment located on the top floor, 4th floor, of a 19th century building, fully renovated, at Elevador da Bica. Situated in one of the most emblematic areas of Lisbon, which join the best of the life and culture among the historic and contemporary city. Very pleasant place where you can hear the birds while the animation feature near the Bairro Alto/Chiado. Easy travel to places like Sintra, Cascais, Arrábida. 2 bedrooms, with double bed, light and airy, equipped with air conditioning. Possibility of free crib upon request. 1 living room with balcony in front of the entire length floor overlooking 180º of the river and city. 2 extra beds (divan), Sofa (no sofa/bed) with table, chairs and sideboard. Equipped with air conditioning, cable TV, DVD, internet wireless. 1bathroom, with bath and window with river view. Fully equipped kitchen that connect directly to the terrace. Private terrace with BBQ, table, chairs, parasol and flowers. Towels are included in the price. Fabulous week in a beautiful setting! We loved the apartment, particularly the balcony overlooking the river and the city. We were treated to a spectacular sunset on arrival and much of our time at home was spent admiring the view. The apartment offers everything you need and more. The patio off of the kitchen was delightful and we were surprised by how quiet it was even though we were in the center of town. Tania was very welcoming and responsive. Her husband brought over an enormous umbrella for the back patio that was greatly appreciated. The kitchen is well-appointed and everything is in perfect working order. The stairs up to the apartment are rather steep, but nothing compared to the rest of the city. If you stay in central Lisbon, you'd better be able to handle a lot of stairs! The apartment is very close to the Ribeira market which is great for dining as well as fruit and vegetable shopping (the market also has fresh fish), There's a small grocery in the street and the grocer was very welcoming. Book without any hesitation at all. Thank you, Tania! We would love to return! Very comfortable apartment with great views, very well located. I enjoyed staying at this apartment which had everything I needed, was comfortable and close to transport, markets and many of the sights. It is on the fourth floor, so lots of stairs, but the view over the rooftops to the river was worth it. Tania was helpful and very obliging. Thank you so much, Tania. We had a wonderful stay in your apartment. We found it to be very clean, quiet, well-equipped, close enough to walk to areas of interest for exploration. The beds were comfortable and the rainfall shower was fantastic. This apartment was very nice, in a fantastic location, with a great host. We were close to everything, yet it was very quiet at night. If we ever go back to Lisbon, we will look for this apartment again. My husband, adult daughter and I loved our stay in Lisbon. Tania was helpful and dependable. She provided us information about transportation and local restaurants, and also arranged early taxi to airport on departure day. The apartment is well-equipped, tastefully decorated and clean. Found everything we needed for a comfortable visit. Walking distance to many sights and easy walk to other transportation. Thank you, Tania! The apartment was great for 5 of us- 3 adults, 2 children -16 and 8. We used the fold down bed and there was plenty space for this in the livingroom to give our teenager their own space. The view is just as in the photos. The little terrace is also very handy to have meals al fresco. Everything in apartment clean and good quality. Tania is an excellent host and even sent info after arrival of things to do and links to timetables etc. The stairs just match the rest of Lisbon- it’s not a place to come if you don’t like a bit of exercise- I enjoyed the workout but really not too taxing as I’m not that fit. Highly recommended. Apartment located in the heart of one of the most typical quarters of Lisbon, near the Elevador da Bica. Between the riverside area of Lisbon and the Bairro Alto/Chiado. Close to the main cultural attractions, architectural, commercial, entertainment and landscape of the city. Area served by all kind of transports: subway 'metro', tram, bus, boat, train, taxi. Extra fee of 40€ for check in/out between 9:00pm and 8:00am. For stay less than 5 nights in high season/peak season and stay less than 3 nights in low/medium season it can be charged an extra fee.